For all its centuries-old traditions and generally conservative outlook, sometimes Italy really surprises me with its modern take on things. Like having fully automated shops. Something I thought only existed in Japan! But well, hey no, they are ubiquitous here in Italy, too. Giving you a chance to buy a loaf of bread, a pint of milk or a bag of ice when everything else is shut. Which doesn’t have to be at night. As, you see, Italians, especially in places outside of the big tourist spots, still stick to their centuries-old tradition of taking an extended break of about three hours each afternoon, at which point shops and offices shut their doors and pull their metal shutters down. So, what do you do, if you need a cup of coffee, a pack of fresh mozzarella or, ahem, a condom, exactly at that time?! Of course, you run to the vending machine down the street and pay an exorbitant price for the convenience to have what you need then and there instead of having to wait for the shops to re-open at (depending on the shop) 3:30, 4:00 or 4:30 pm. Or even at 8:30 the next morning, if it happens to be Wednesday. Yes, on Wednesdays shops in our neighbourhood are only open for half a day. I understand this is a common practice in Italy, just the specific day on which this happens can differ in the different parts of town. So, the vending machines seem to satisfy a real need. No wonder there are so many of them and no surprise really that they have been adapted for such a variety of products. No wonder also that they don’t seem to have taken off in a similar fashion in England, for example, where shops, especially those for food and drink, seem to work round the clock in an eager pursuit of your disposable income. Perhaps, they need to take a leaf off Italy’s book, as Italians, somehow, manage not only to have a really long lunch break, but they still keep selling you stuff. 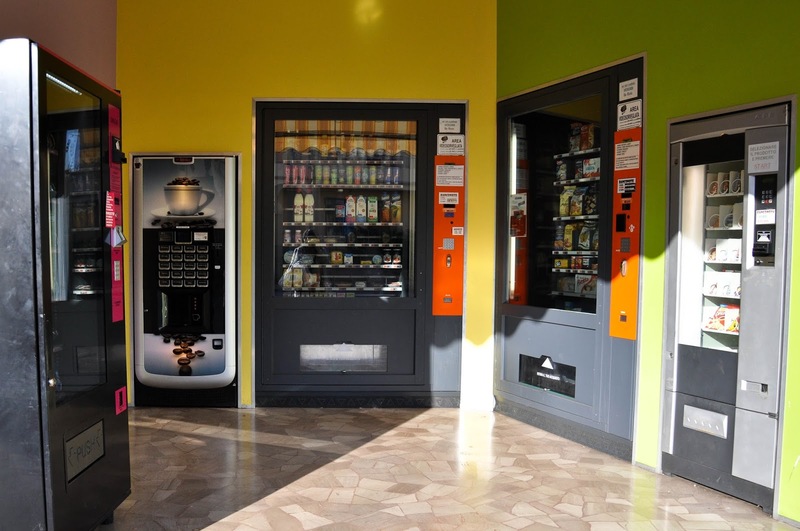 So, without further ado, let me show you the six types of vending machines I have come across on the streets of Italy. Right at the end of the list, you will find a little bonus too, so read on. 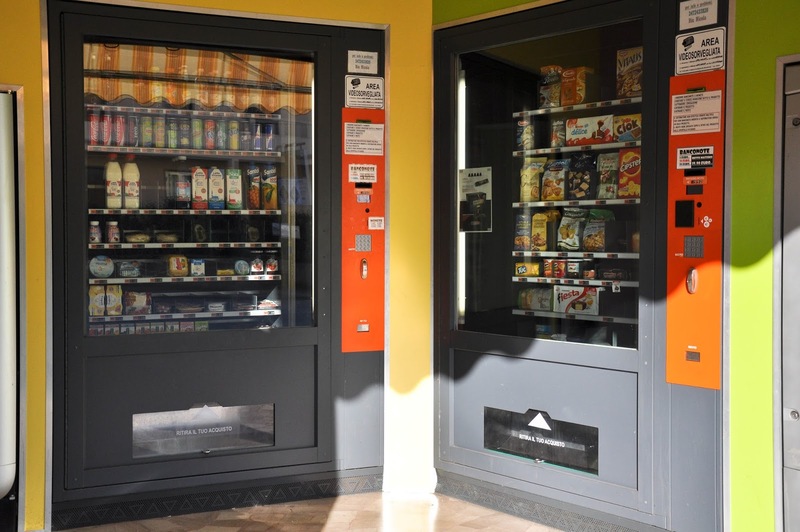 The food-vending machines sell a wide variety of products – from loaves of pre-packaged bread through fruit juices and chocolate bars to packs of sliced salami. Sometimes, they are grouped together in an automated shop (see the first picture above). Other times they are built into the external wall of a local shop. 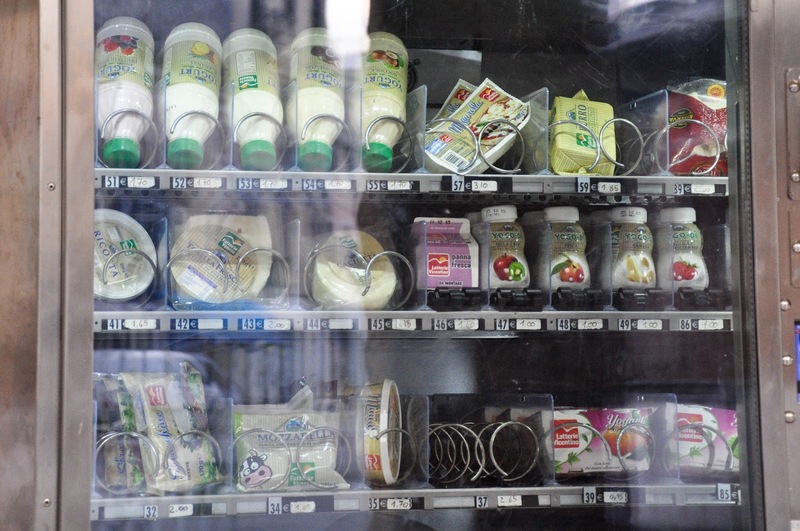 The second picture shows one such vending machine operated by a small deli specialised in dairy and meat products from local farms. In fact, once we visited a local farm and they did have such a machine themselves, so that you could stock up on fresh milk and cheese irrespective of the time of day. Italians love coffee and are unsurpassed in making the best cups of coffee I have ever had. 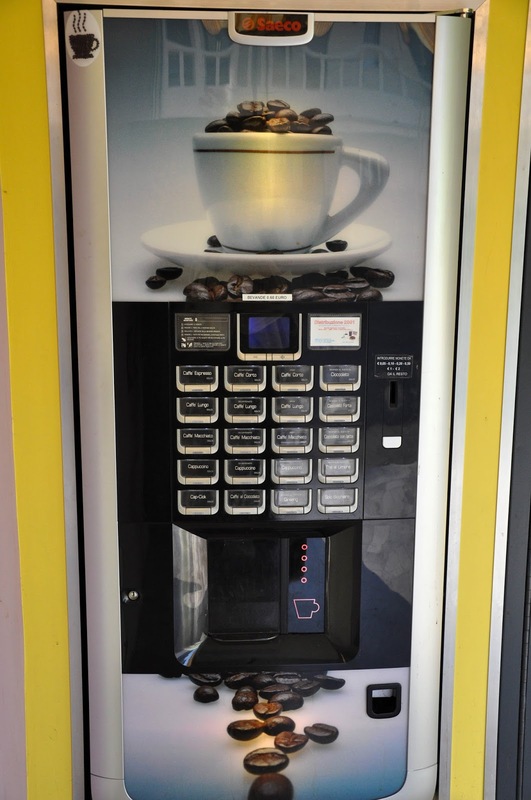 It is not surprising then that their coffee-vending machines actually serve a large variety of coffee-based drinks which are rather nice. The machine I managed to photograph, was one of the small ones, so you can expect to see much larger ones with even bigger menus. Note that there are options not just for basic drinks, like espresso and cappuccino, but you can also indicate if you prefer a decaf coffee, a barley coffee or even a chocolate cappuccino. 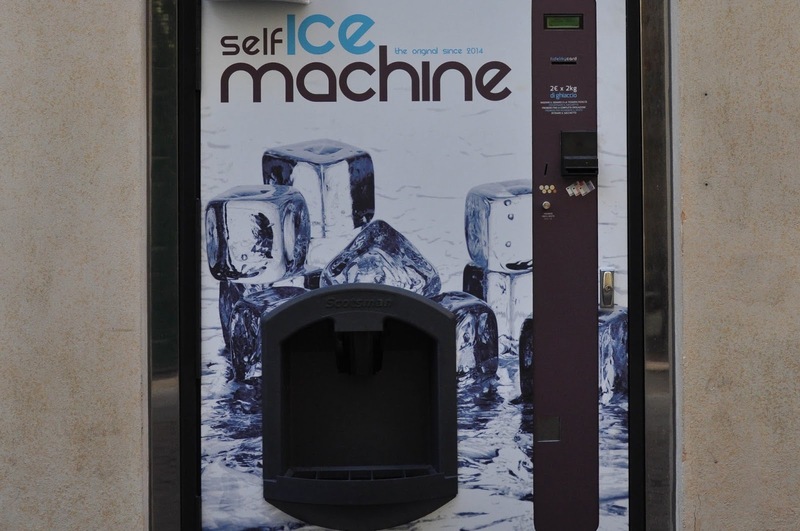 When temperatures stay at 40 degrees Celsius for weeks on end in summer, ice-vending machines can be a godsend. 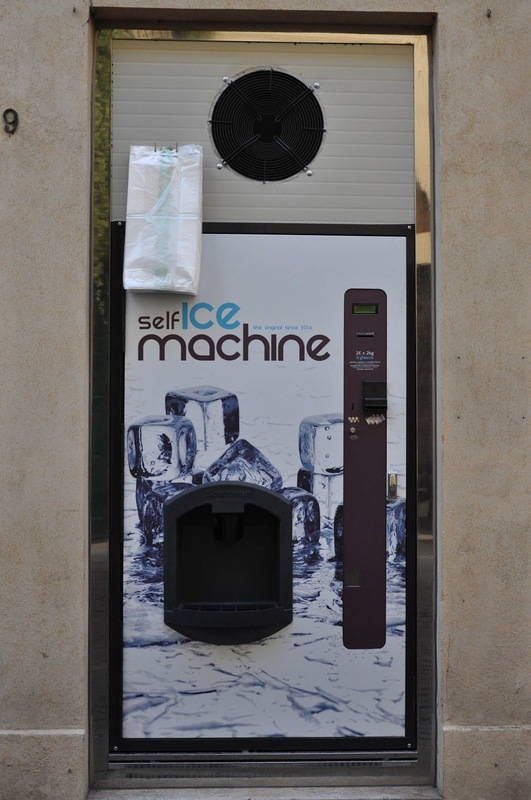 You pull a plastic bag (handily attached to the machine), pay 2 euros and the machine dispenses 2 whole kilograms of cold ice. Perfect to cool down drinks or yourself. Italians smoke a lot. Yes, even on the street and around children. 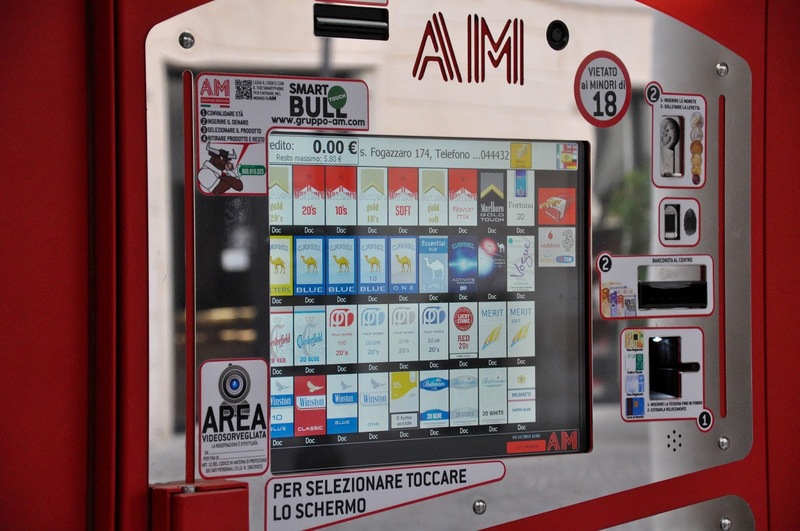 So, cigarette-vending machines can be easily found spread all over town. They are usually installed outside of tobacco and newspaper shops. To use them, you need to prove that you are over 18, by inserting a suitable form of ID in a special slot of the machine. For some reason cigarette-vending machines always seem to have a mirror surface (at least the ones I have spotted so far). Perhaps, it is intended to be some sort of deterrent. Like, the smoker buying cigarettes looks at himself in the mirror and suddenly faces up to the truth that he is spending money and his health over something as stupid as smoking. Unfortunately, it doesn’t seem to be working much. These are machines with a twist. Don’t expect them to sell you a half-liter of overpriced bottled water. 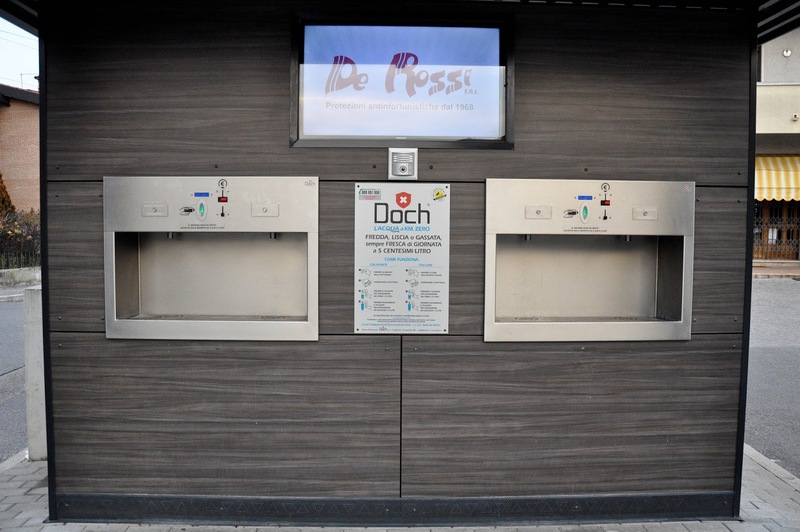 Instead, for the humble sum of 5 eurocents they will dispense a liter of Zero Km water – either fizzy or still, depending on what you prefer. Italians are big on not wasting natural resources, so the Zero Km movement is really strong. As such they prefer to shop locally grown vegetables and fruits instead of flying in asparagus from Mexico and green beans from Kenya which is the case of British supermarkets for example. The same seems to apply to water. So these huge machines, called ‘Casa dell’Acqua‘ have been installed in some villages and towns. The local population can then buy a crate of glass bottles and fill them in with fresh water from these machines as and when they want. 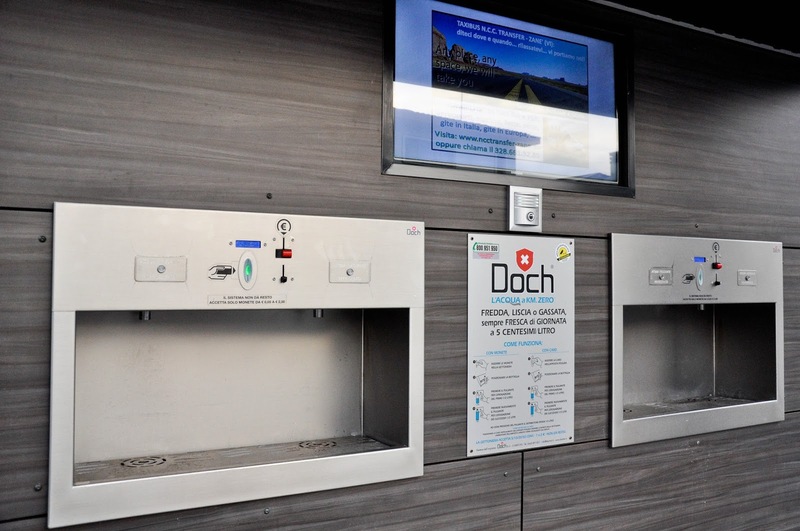 Just to clarify that tap water is perfectly safe and drinkable in Italy, but these water-dispensing machines are a great alternative to water sold in plastic bottles and flown in from abroad. 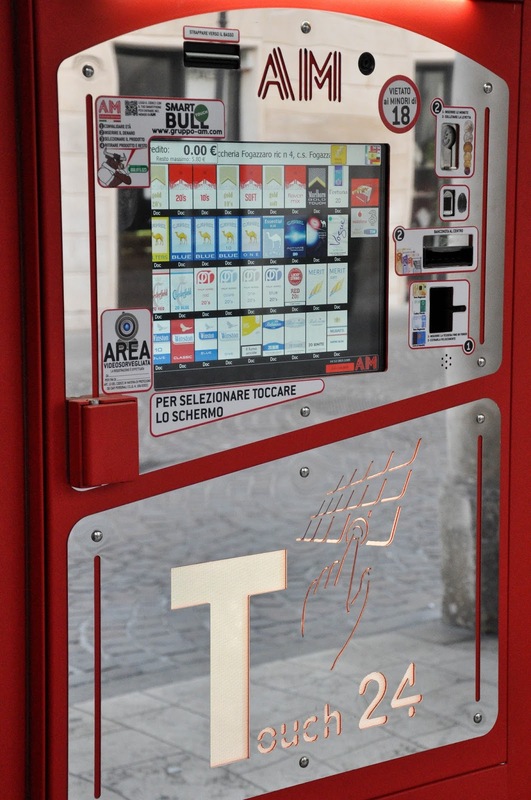 For it being a Catholic country, condom-vending machines are really obvious everywhere you go in Italy. I remember seeing my first one several years ago whilst on a weekend trip to Tuscany. I was in San Gimignano and had just bought myself a gelato from what it is supposed to be the best gelato shop in the world (where the walls are covered with letters of gratitude from stars, celebrities and even politicians), when outside of the shop I spotted a blue machine, not unlike an ATM. Instead of cash though, it dispensed condoms. Right in the middle of the main square! So, whilst other countries keep such machines tucked away in public toilets for example, in Italy you can expect to see them rather more prominently displayed. They are either small and attached to walls or larger like the one pictured above and apart from condoms can also sell pregnancy tests and other such stuff. 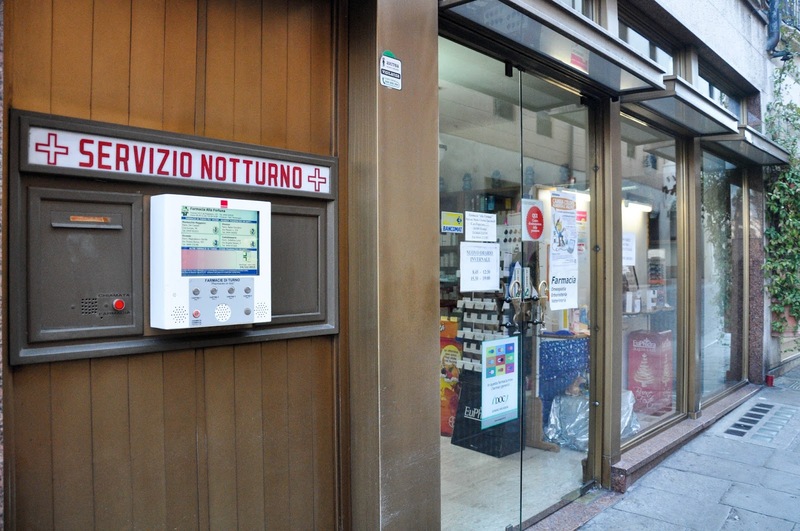 If you ever need to buy medicines outside of normal working hours, consult the electronic displays which are installed outside of the pharmacies in Italian towns. They show you the nearest pharmacies on duty, their address and how to get there. 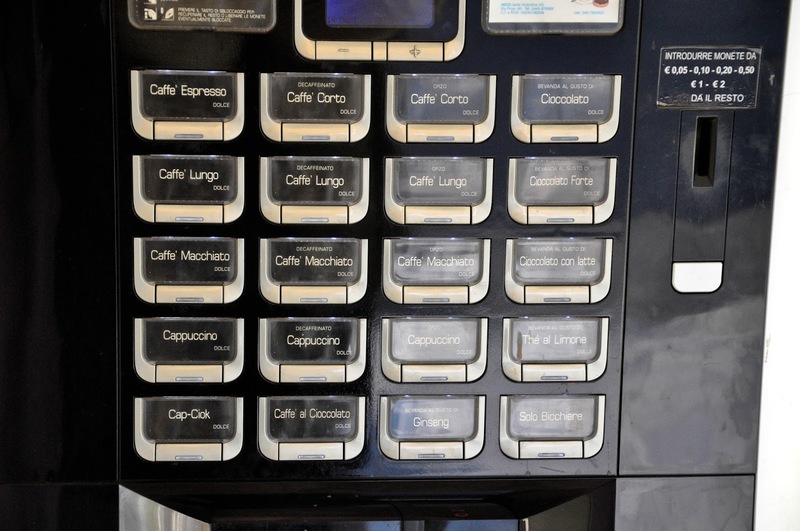 I hope you enjoyed reading this little expose on Italian vending machines. Have you used any one of them during your visit to Bella Italia? 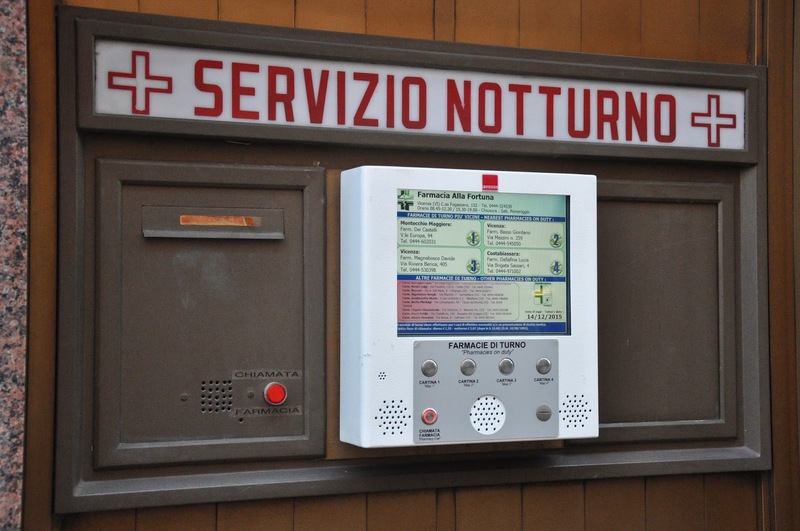 Or, perhaps, you have come across a type of vending machine which Italians haven’t managed to install yet? Let me know in the comments section below. Ta!